Natural and manmade underground facilities have played an important role in warfare and national security for more than 5000 years. Underground chambers were used for hiding places and escape routes in Mesopotamia and Egypt from 3500 to 3000 B.C., and they continue to play an important role in the ongoing conflict in Afghanistan. Some notable twentieth-century uses of underground facilities for warfare and national security include dozens of underground factories constructed beneath Germany during World War II; the Cheyenne Mountain Operations Center, Colorado; as many as 1000 underground facilities estimated to exist beneath the Korean Demilitarized Zone; and countless natural and manmade caves used by al-Qaeda forces in Afghanistan. Large manmade cavities in salt domes along the Gulf Coast, some of them larger than 17 million cubic meters in volume, are used for the United States Strategic Petroleum Reserve. The details of underground facilities used for military or national security purposes are classified, but there is no reason to assume that they are not on the scale of underground civil projects. The largest unsupported span ever constructed in rock was a 61 m (200 ft) wide hockey arena constructed for the 1994 Winter Olympics in Norway, and underground mines in many parts of the world consist of smaller passages that extend for many miles. Extensive underground facilities have also been constructed to maintain communications and house the United States government in the event of an attack. An underground facility known as Site R exists within Raven Mountain, Pennsylvania, and is thought to have been the location from which Vice President Cheney and other officials worked in the aftermath of the September 11, 2001 terrorist attacks. Construction of Site R was authorized by President Truman and completed during the early 1950s. Declassified information dating from the construction period describes a three-story underground facility with more than 18,000 square meters of floor space and room for more than 5000 people. The existence of another extensive underground facility beneath the Greenbrier Resort in West Virginia, constructed to house the United States Congress in the event of a nuclear attack, was made public in 1992. Although they can be expensive and difficult to construct, underground facilities offer two important advantages over surface structures. First, they are almost completely hidden from view and activities within them can be invisible to even the most sophisticated intelligence satellites. Second, their depth can make them resistant to conventional and some nuclear attacks. Additional advantages include lower long-term maintenance costs (because underground structures are not exposed to weather) and lower heating and cooling costs (because temperature is constant in underground environments). The detection and characterization of underground facilities and the development of technologies to defeat hardened underground facilities are among the principal goals of modern military geologists. A car enters the U1a Complex, an underground facility in Nevada designed for conducting subcritical experiments to determine whether aging nuclear weapons remain reliable and safe. pressure of 0.1 MPa). In order to prevent thermal disintegration, therefore, aggregate for concrete that may be subjected to extremely high temperatures must consist of rocks containing little quartz. Cut-and-cover structures can be difficult to hide during construction, when they can be easily pinpointed on remote sensing images or aerial photographs. It may also be possible to locate shallow cutand-cover structures after construction if soil disruption or activity within the structure produces a thermal, soil moisture, or soil chemistry anomaly identifiable through multispectral or hyperspectral image analysis. Deep underground facilities can be constructed using specialized tunnel boring machines (TBMs) or by underground drilling and blasting. These construction techniques are used extensively in the underground mining industry and the construction of civil works such as tunnels. Tunnel boring machines are large pieces of construction equipment with faces that consist of rotating cutting tools, allowing the machine to drill itself into earth or rock and create tunnels many meters in diameter. Underground construction by drilling and blasting begins with a carefully designed pattern of holes drilled into a rock face. The holes are loaded with explosive charges that are detonated according to a specified sequence in order to efficiently fracture and loosen the rock, which is then removed to expand the underground opening. The primary geologic factor controlling underground construction in rock is the nature of the rock itself. Strong rock with uniform physical properties is the preferred choice for underground construction. Clandestine tunnels excavated beneath the Korean Demilitarized zone by North Korea, for example, tend to be located in granite that is relatively uniform and contains few fractures rather than adjacent rocks that are more highly fractured. Depending on the geologic setting of an underground facility, selecting choice rock may not be an option. Rocks are commonly heterogeneous, with physical properties such as strength and degree of natural fracturing varying from place to place. Engineering geologists and civil engineers commonly describe the physical quality of rock using a simple parameter known as the Rock Quality Designation, or RQD, which is obtained by measuring core samples obtained during exploratory drilling prior to construction. The RQD is the percentage of pieces of core sample longer than 10 cm (4 in) divided by the total length of core. Thus, a core sample of intact rock with no fractures or cracks would have an RQD of 100. A core sample of highly fractured rock in which only one-quarter of the pieces are longer than 10 cm would have an RQD of 25. Other factors that affect the design and construction of underground facilities in rock include the number and density of natural fractures in the rock, the roughness of fracture surfaces and the degree of natural chemical alteration along fracture surfaces (both of which affect rock strength), the presence or absence of water in the fractures, and the presence or absence of zones of weakness such as faults or rock that has been altered to the consistency of clay. Highly fractured rock near a large fault, for example, may be too weak to support itself above an underground cavity or serve as a conduit for high-pressure water that can quickly flood an underground opening. Completion of the NORAD underground facility in Cheyenne Mountain during the 1960s, for example, was delayed for more than a year because of problems with a geologic fault intersecting the ceiling of the underground opening. Underground openings in weak, highly fractured, or water saturated rock can be lined with reinforced concrete or shored with steel beams in order to ensure the safety of construction workers and later occupants of the space. The lithostatic stress that must be resisted by underground openings of any size increases linearly with depth, and the most stable underground openings are generally circular or spherical. Rectangular or cubic openings contain sharp corners that concentrate stresses in the rock and can lead to the collapse of the opening. One issue that is important for military or securityrelated underground facilities, but generally not for civil structures, is their vulnerability to attack by conventional or nuclear weapons. The vulnerability of an underground facility to a conventional weapon attack is a function of its depth, the strength of the overlying rock, and the penetrability of the soil or rock exposed on Earth's surface above the facility. Knowledge of these properties is essential to those designing facilities to survive attacks as well as to those designing specialized earth penetrating weapons (EPWs). The geologic information necessary to evaluate the vulnerability of a facility has been given the name "strategic geologic intelligence" by some military geologists. Few, if any, underground facilities can withstand a direct nuclear attack. Underwood, J. R., Jr. and P. L. Guth, editors. Military Geology in War and Peace. Boulder, Colorado: Geological Society of America, 1998. Weiser, Carl. "'Secret' Government Site Not So Secret after All." USA Today (June 26, 2002). Leith, William. "Military Geology in a Changing World." Geotimes, American Geological Institute. February 2002. < http://www.agiweb.org/geotimes/feb02/feature_military.html >(December 10 2002). Linger, D.A., G.H. Baker, and R.G. Little. "Applications of Underground Structures for the Physical Protection of Critical Infrastructure." CE World. 2002. 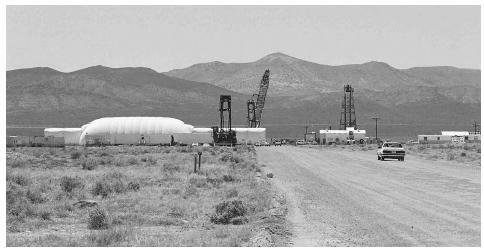 < http://www.ceworld.org/ceworld/Presentations/CriticalInfrastructure/Appl cations-of-Underground-Structures-for-the.cfm > (December 11 2002). "Rock Tunnelling Quality Index." Edumine. < http://www.edumine.com/Xtoolkit/tables/rtqitables.htm >(December 11 2002). U.S. Air Force. "Cheyenne Mountain Operations Center." < https://www.cheyennemountain.af.mil/cmocindex.html >(December 11 2002).